A lightweight utility ATV with heavy weight fun, the MUX 270 rules the ranch and thrives in the thickets. The MXU 270 is an ATV short in altitude, tall in attitude. There’s nothing like the KYMCO MXU 270’s light-duty level of can-do performance. It can tow and carry over 500-lb., perform as an awesome trail bike, and do farming duties, making the MXU 270 a hands-down thumbs-up value leader. Designed for riders 14-years old or over, the MXU 270 is the ATV for novice riders. Around the ranch, the yard, or the farm’s lower forty, it makes quick work of chores with its 270cc liquid-cooled, carbureted, 4-stroke engine, and automatic CVT transmission with F-N-R selection.Shaft drive, dual A-arm front and swingarm rear suspension, preload adjustable shocks, dual-disc front and single-disc rear brakes, 22-inch tires, and cargo racks add to its value. Available in Red, Tan, Green, or Blue. 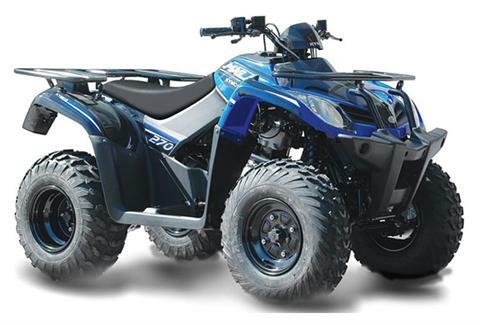 ATV riders younger than 16 years of age must be supervised by an adult, and should take a training course. Hitch bracket - 500 lb.